One of the most deceptive forms of blog spam is copying previous comments in a thread or text from the blog post or another site and using them to create or automatically generate a new comment. This type of spammer loves to target dofollow blogs that use plugins like CommentLuv and especially KeywordLuv. Since many businesses are not aware that they are paying for links using tactics like this one, I am writing this post to point out how this reflects on their businesses as well as the company that is creating spam comments using this method. Copying a comment written by someone else and using it as your own is clearly unethical. This comment was submitted by a company called ConversionHub based in Singapore. They have an attractive, well-written Web site; however, their actions are a clear indication that their ethics are not in alignment with mine. I would never knowingly recommend a company that acts in a manner that could damage your businesses reputation. Here is the information from WordPress with the email address obscured because that information is not made public when we comment in a blog. They are far from the only SEO company selling businesses on the idea of spamming dofollow blogs. Business Ethics has become as rare as “common” sense. Some of us must be willing to make it far more clear what is ethical and what is not as few have been exposed to ethics training and have no role models with strong moral ethics. It is unfortunate that society rewards unethical behavior far more consistently than doing the right thing; however, that does not change what is right or wrong. Being unethical is now the accepted norm in America and across the globe. Mical Johnson recently warned his Internet Marketing Tips blog readers about Online Scams by Fortune 500 companies – another misleading scam in a long history of hidden charges and fees. While this may be a good start, the bottom line is we have generations of people who do not have the critical thinking skills to make ethical decisions. Those who do must lead by example, write about it often, and not condone or even tolerate bad behavior. I am not certain that most people really DO know what is right. How could they when it is so obvious that selfish behavior is consistently rewarded and greed – especially Corporate Greed – is much admired. Among those who do, I wonder how many – including Schwarzkopf – have the courage to do what they know is right. Those of us who work together can make our own ethics crystal clear and raise the bar for the many. As we build collaborations of bloggers and collaborate with each other on Social Networks it will become important to ensure that those we recommend and work with share our values and ethics. Developing critical thinking skills is essential for accurately discerning the truth. I have included some of the best resources I’ve collected over the years below for those who value being a thought leader instead of a follower. NOTE: Not all ISPs (Internet Service Providers) use static (permanent) IP addresses. Many still assign them dynamically as Internet users log in. What this means is that banning IPs may block innocent users and may not block spammers. I include them here so they will be indexed but have not verified whether they are static or dynamic so use good judgement when using this list. This is reality.Spam is growing everyday on the internet. I hope they are banned! It is really difficult to combat the menace of comment spamming unless the processing remains auto approval. Manual approval of comments can stop spamming to a great extent although its little hectic and time consuming but I think this to be he best way. Fortunately there are spam filters that try to address on these issues, however they are not always the best solutions. Genuine posts sometimes get filtered as spam, so blog owners have to manually pick them from the spam queue. There’s no better solution to stop blog spam but to have real people (moderators) that check on the comments. As much as I hate blog spammers, I have to object a bit on something. In principle a comment should not really be used as a mean to get ranking benefits for a linked website. It should be a genuine intent to contribute to the content value. But if a comment does bring extra value to a blog it may deserve a small reward. Unfortunately linking to a site with a name rather than a keyword DOES hurt certain aspects of the ranking for that particular linked page/site. Its really a stiff struggle with the spammers and everyone is trying to keep them away. Some are so perfectly written I even responded to some 🙂 The commenting tribe helps us learn more and why is there a need to copy and paste when writing ourselves is so much better. It would feel so helpless to copy and paste. Blog commenting is not just reading and doing comments. I think it’s much more on building relationships and sharing ideas. There should be a software or plugin that can prevent this types of spammers from doing that kind of comment. I am very much impressed with your blog post. Copying content or comments and writing them as your’s own is truly unethical. Blog Comments are meant to show what you feel about the blog post after you have read it. 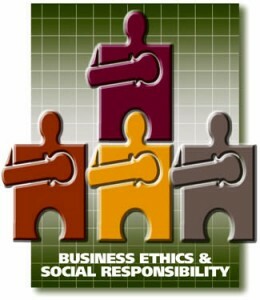 Sadly, business and ethics are not often considered in the same sentence. Many often think of them as an oxymoron. This should not be how it is. I do believe most people know right from wrong, but acting correctly means they would have to come out of their narcissistic world. If you put something in quotes and give attribution that is ok, but to just copy what someone else has written and pretend you wrote it is a violation of copyright laws and could cause legal issues for the blogger who approved the comment not knowing it was copied. If you want bloggers to let you have links you need to at least make the effort to read their posts and write something relevant in your comment. Those kind of comments are definitely a big headache. Most comments are moderated. Id say 95%. so most of this garbage commenting should be caught. Happens to us all and all we can do is reject and move on. The problem all bloggers have is deciding what comments to keep and which to reject. It is not a black and white issue except for the simple-minded because of the importance of links to being found online. That is how spammers do when they commenting in one blog or article. Its really a very cheap way. Such type of spammers should be globally banned. I heard a cool anti-spamming technique for contact forms (sure it would work for comments). Create a couple extra forms (spam scripts will try to will out every form) but hide them with css (display:none works I believe) and then use a server side script that says, “if all the forms have been filled out, then don’t process”. I’ve not tried it, but it sounds like a good idea to me. That sounds like an ingenious idea. I have forwarded it on to my WordPress Ninja to see if you would like to test it. Have you read my posts about Supporting Small Businesses? There are many links at the bottom of that post that may interest you. No one tolerates spam anymore and I know such copied comments or automated commenting softwares do exist still which I hate the most and that’s what destroy it for those who want to contribute genuinely. Forums, blogs, etc have been spammed by such softwares and people. And yes clearly they do show the ethics of such companies as here the culprit is itself a SEO company so I am assuming that they’ve not outsourced it to someone else and probably asked any of their link builders to do the work for them. But the businesses who’ve outsourced their SEO work should keep a close eye on the people whom they’ve outsourced to, because SEO company could either add value to or break their reputation. One big issue is that most business owners have little to no understanding of what SEOs do and have no idea whether the company they hired is spamming blogs or not. It is difficult to keep an eye on what a company does when you have no idea what it even is that you paid to have done. We all need to tell our friends and businesses we frequent not to hire companies that cold call and email them without asking someone knowledgeable about Internet marketing. I keep telling people not to spend a dime without asking me first but they often forget and end up getting burnt. If anyone needs assistance and doesn’t know someone who can advise them they can ask me at no cost. .-= growmap´s last blog ..What Type of Twitter User Are YOU? =-. Comment spam can be a real hassle, on all of my blogs I manually approve all comments to ensure that no spam gets through. I also use Askimet plugin to help me control the situation. Manually approving comments is one option but I choose not to because it reduces the incentive for Social Media savvy commentators to share my content. See my post that explains how blog commenting and sharing greatly increases traffic to blogs. 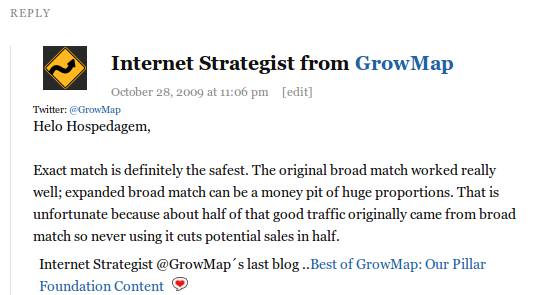 .-= growmap´s last blog ..Follow Friday: XLNT New Social Networking Blog =-. Yes i think spam comments are really a big headache in now a days,but askimet is a good option though it will prevent some some spam comments to some extent. Most bloggers use Akismet plus some other plugin in combination to slow them down but we still have a ton of moderating to do. it is a form of spamdexing people do this to promoting commercial services to blogs.really very irritating.they do this only to get high page rank.well i got good points here really good to know thanks for this fantastic work. As an employee of a company that is about to get banned from this blog for spamming you should know. I have tried to email several of your addresses to no avail. 2) Do you really think you can rank any site for the word “garage” and even if you could why would you want to? I suppose you haven’t thought about the other reasons someone would search for the word garage like building a garage or garage doors? There are far better keyword phrases for an auto repair business. They are wasting their money. There have been a huge number of comment spam that is in the form of jokes, the thing is the jokes that they leave in the comments are actually fairly funny – anyways they have appeared on many of my blogs until I enabled mister Akisment. .-= sarah@Florida dui attorney´s last blog ..All About Florida Ignition Interlock Devices =-. Yes, spammers will do anything hoping we won’t delete their links. Do remember that Aksimet can also catch valid comments so you have to look through them and “rescue” the real ones. Hi,I like this post.Thanks for sharing it. 1) I hope you subscribed to comments and read this. 2) So others learn not to leave comments like this. I have been hit by a wave of this recently as my blog is do follow and it’s a total pain, as often Akismet misses these culprits and you really have to be careful and moderate comments. I agree it is all a pain and time-consuming but anchor text is so important to small businesses and blog owners that I feel it is important to live with it and provide them what they need. More education would help because many business owners are hiring spammers without realizing that is what they are. I do agree with you that copied comments are completely un-ethical. Spamming is most detrimental to your online reputation. .-= Online Reputation Management´s last blog ..Reputation Management – Fix Your Online Reputation and Remove Negative Results =-. I’m thinkin’ Akismet looks at “approve” and “spam” a whitelist and blacklist….makes sense to me. Probably so; however, I would still prefer a separate whitelist (for ME and you and my other regular commentators I trust) and blacklist (for specific spammers I add to route their comments directly into a trash barrel instead of among those I may want to rescue. Regarding the threaded comments, you can click reply and they will be immediately under the rest of the thread. It just doesn’t indent them any further. I see you already wrote a post that fits my Thankful MEME and I went to comment in it. As often happens I can’t remember how I’m supposed to comment so I read your Comment Policy and used a one word nickname (GrowMap) followed by my keywords (Internet Strategist). I hope that works for you. If I can remember what is ok I’ll comment more often! Hey dear, how did you do that ? I mean is it really easy to catch such spammy comments, if they are clear then its okay, anyone can get them. I hope my regular readers appreciate the challenge of writing in a secondary language and my patience in assisting commentators to write better comments. I’ve decided it would be helpful to share how comments come across to me and perhaps others will share (politely) what they think too so that you and other commentators can improve their English skills. It is usually unwise to use a term of endearment (“Hey dear”) when addressing people you don’t know personally. Many will take offense and it reminds me of waitresses on bad television shows who call everyone “dear”. There are some waitresses in real life that do that; however, depending on their tone of voice that can be seen as either condescending or overly affectionate to use with someone with whom you do not have a personal relationship. It is also wise to avoid using shallow compliments and commands like “keep up the good work” in comments. I don’t know anyone who likes to be told what to do and at least the wise people don’t care for insincere compliments – or even sincere ones overdone. Askimet addon for wordpress is awesome to find such spammy comments, This addon automatically disregard the spammy comments that made from same IP address. Akismet may or may not immediately mark comments from the same IP as spam. I often get several dozen from the same IP and have to delete them. It is more likely that they end up in spam because bloggers start reporting them. Your comment reminds me of another challenge I see regularly. While yours doesn’t quite have the issue many others leave comments that sound like definitions of the subject. That is not a great way to get comments approved either. Commentators – regardless of their native language – would do best to write comments the way they would discuss any post with the author and other readers. Write the way you would speak to a business manager or client. My own experience is that Akismet does a good job catching spammers. The bigger problem (as the above comments allude to) is that it falsely catches non-spammers too. I also wanted to say: You are shaking your head at the sad state of the world. And, certainly, if you look for it there’s more than enough terribleness to shake your head at. But if you look for it there’s a lot of wonderfulness too. The flip side of spam comments is that they are a product of there being so many great, thoughtful and popular blogs to leave spam comments on. .-= Spot@tech blog´s last blog ..10 Great Gadget Gifts For Under $100 =-. I suspect that many valid comments are borderline in quality and bloggers mark them as SPAM which leads to false positives in Akismet. Dennis is probably also correct that too many comments too fast looks like a bot instead of a human and that will mark comments as SPAM too. Editing a comment with one or more links in it gets my own reply comments marked as SPAM. All of these behaviors are still better than having to do it all manually. Thank you for the alternative perspective. While I still find it sad that so many don’t understand what I see as basic ethical behavior, I do agree that this type of spam is an indication that dofollow is growing in popularity and there ARE many great blogs and bloggers. Hmmm. You said right many time we find same comment in thread. I think we should follow this strategy to get rid off this problem. Akismet decided you’re a spammer today. I rescued all your comments and kept them so you’ll know. I may have commented to many times too fast…Akismet doesn’t like that either sometimes. This is actually a good thing, as that is a spammer trick too. You’re early. I’ve asked Derek about replacing the Recent Comments plugin with a Top Commentator plugin but we don’t have one yet. Why not have both plugins? Since I reply to most comments here my comments are the most likely to dominate the Recent Comments plugin. I might consider that; however, if I’m going to use a Top Commentators plugin it probably deserves a higher position than the Recent Comments. We all need to prioritize what we have on pages – especially anything that is on every page. I’m seeking a balance between being generous and still having the pages load well for anyone with less than optimum Internet access or an older PC. Not all spammers use only keywords in the name field. The ones that are working for someone else do; that’s part of the deal. The ones that understand how KeywordLuv work often use a name and then the keywords so I wouldn’t count on that. I delete a lot of spam that includes a name before the anchor text here. I meant on my blog. Either way, KWL is not very popular anyway from what I see on my travels. For those who understand the importance of being able to create your own anchor text from related posts and blogs it is VERY Popular. Most bloggers don’t really understand what it is good for or only think of the down side. It is unfortunate that most of the people who understand why KeywordLuv benefits business are not the business owners and often are greatly challenged at writing high quality comments due to the language barrier. that’s great, you’ve caught them, but how did you do that, did you used any scripts to catch spamy comments ? This is so true. We all have the ability to come up with sensible solutions. It’s just that there are times when we are hesitant to put it in actions. Most people just don’t think much and choose to follow the wrong examples. If some must follow I just wish they’d choose better role models. It seems that many businesses throw their ethics out the window when it comes to building links online. SEO does not have to be shady, especially with mechanisms like Keyword Luv that reward people for contributing in a legitimate conversation. All you have to do is take some time to contribute instead of copying other peoples comments??? The saddest part is that many people don’t even know when they’re being unethical. That is one reason I wrote this post and said what I did. There are usually good ways to do the same thing people do badly – like your example of using KeywordLuv and contributing to the conversation. Perhaps we can encourage Akismet to add protection from copied comments. That is the type of thing a computer program could do: identify duplicate content on a specific page and then mark that comment as spam. Even better it could find all previous comments from that individual and automatically move them to spam too. I really wish Akismet would add blacklist and whitelist functions. I would add ME so I don’t have to log in to approve my own replies and also bloggers I trust and blacklist spammers so I don’t have to waste time on them. I have got lost of copied comment on my blog. Its really not good, I informed them to write guest post on my blog who make comment spam. .-= work at home jobs´s last blog ..How to submit article to article directories =-. You will want to delete copied spam when you see it because you don’t want to be blamed for copyright violations. Unfortunately, no matter what software is developed, spammers will find away around it. You should always question companies that offers 5000 high PR backlinks for $3, lol…Do your research and find out how purchasing such services. Yes, con people will always find a way. Many businesses are taken in by their offers because they don’t really understand the Internet, search engines, or linking to bad neighborhoods. I encourage everyone I know to ask me before they spend money for ANYTHING related to online promotion. I can guide them in what to avoid and research any I haven’t come across yet and warn others about those too. Great job done copied comments can never be allowed and for more we can use some plug ins for security. As bloggers report them as spammers Akismet will catch their activities. We must be vigilant at removing any benefit they receive and educating businesses and each other on how best to deal with them. It is really a great way to improve your business.Business ethics are important but are difficult to enforce. I am a member of a professional organization with a defined ethics policy in it’s bylaws. You’ve made my point. I’m shaking my head about the sorry state of the world. When people are ethical they don’t need to have their actions controlled by policies or enforced by anyone – although guidelines and education are very useful. More training would be more viable than rules and enforcement. Those who desire to be ethical can read and think on the subject and hone their ability to make better choices and think more critically. For those who understand what is unethical but choose to act unethically anyway – either because “everyone else does it” or because they are selfish or greedy – are best avoided by anyone who desires to live an ethical life. I do agree with you, many people spam the do follow blogs with the comments, just for sake of comments. They either copy paste comments or just use the tools to make auto comments. The biggest factor is that the WordPress best plugin like akismet is also not able to stop such spamy comments. Your Avatar made me smile. Akismet does catch some of the spam comments like that; it caught that one and I’ve seen it catch many of them. It did not catch a whole slew of comments that just came in today that I have deleted before though. I wonder if the spammers realize that one comment that is copied will get all their comments deleted? When I see one copied comment I now search, mark as spam and delete all comments from that source. Akismet will “learn” and eventually catch them all as more and more of us hit spam instead of just delete. I appreciate what Akismet does but it doesn’t catch everything and this time it caught your comments. That is why I wish I could whitelist myself and my regular commentators. It does periodically catch legit comments, which is why I always advise periodically (if not regularly) scanning the spam section. It doesn’t catch everything immediately, but what could? Akismet is awesome because it is designed to learn, and it does this via the spam link provided to admins. If a particular URL is spammed enough times by different bloggers, Akismet will eventually spam it automatically. Akismet is definitely responsible for keeping blogs clear of the worst overnight spam. I review all comments – usually daily or even multiple times daily in this blog – and rescue those that are real. I still think whitelist/blacklist functions would make a great tool even better.